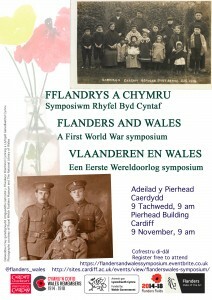 This one day symposium on the Welsh and Flemish experience in the First World War, sponsored by the Cardiff University, the Government of Flanders, and the Welsh Government, held at the Pierhead building in Cardiff on 9 November 2017. Presentations will be offered on the military experiences in Flanders Fields, on the hosting of Belgian refugees in Wales, as well as the wider social and literary context. The symposium is organized with reference to the commemoration of the Passchendaele campaign of July-November 1917, 100 years ago. This centenary has been marked by a wider series of commemorative events, with a Welsh Service of Commemoration in Flanders on 31 July 2017, and collaborative projects between the Government of Flanders and the Welsh Government, including this symposium. Booking Attendance at the symposium is free and lunch will be provided. If you wish to attend please do so on the following webpage https://flandersandwalessymposium.eventbrite.co.uk. Places at the symposium are limited and will be allotted on a first come first served basis.